Sports car designs are notorious for having two main goals: look good and go fast. It’s a pretty simple one-size-fits-all formula that has worked well to sell cars for a long time. Lexus is turning that concept into something a little more, well, heartfelt. A Lexus RC F coupe has been outfitted with electro-luminescent paint so it can display a visual representation of the driver’s heartbeat. With this move, the luxury car company has introduced what is perhaps the most personalized sports car on the planet. 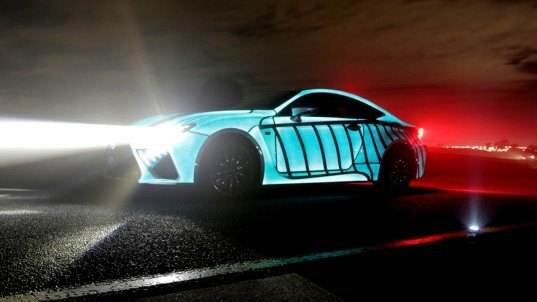 Lexus is calling this one-off creation “the heartbeat car.” The glow-in-the-dark rolling ‘emotivehicle’ is the result of a partnership between the creative technology division of M&C Saatchi Australia, Tricky Jigsaw, and Lexus Australia. The project’s goal was to shift the conversation about sports cars from speed to feelings, if you can imagine, and one way to emphasize the connection between car and driver was to find a cool way to display how the driver responds to the car. Although one’s heartbeat while driving a sports car is arguably a little less about emotions and more about adrenaline, the heartbeat car succeeds in doing something no other sports car to date has been able to do: show the world how it makes its driver feel. The technology behind this achievement is pretty cool, too. The driver dons a standard heartbeat monitor before getting behind the wheel, which sends the heartbeat wirelessly to a control board mounted in the rear of the Lexus. The development team custom built the Arduino board to translate the electrical signal of the heartbeat into prompts that the electro-luminescent paint displays on the car’s exterior. It uses a pre-determined, pulsating pattern to show the driver’s heartbeat on the car’s side panels, which ends up looking a lot like an LED array. When the car is parked and the heartbeat system isn’t being used, this Lexus looks just like any other, with a shiny silver sheen and no indication of the emotive capabilities painted on its surface. Perhaps like many sports car drivers, this concept car keeps its feelings hidden until it hits the road.